YouTube no longer allow new accounts to be monetized immediately to help curb the amount of illegal uploads. Previously anyone could monetize their videos immediately. Now though Google has changed that in an attempt to curb uploads of copyrighted content. I’m all for changes that will improve the overall health of the YouTube community. In theory this should make a difference. How big of a difference we’ll have to wait and see. Anyone can still create their own YouTube channel and upload videos. 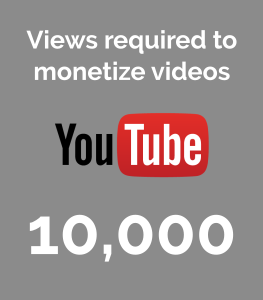 But now there is a minimum requirement of 10,000 views before you can make money from ads on your videos. Promote the content and give it a good title, descriptions and tags so people find it. Once you’re up and running the money can then start to trickle in. Remember that it doesn’t mean you can’t make money at all on the first videos you upload. It means you won’t make money on the first 10,000 views. For example, if you uploaded 10 videos and they each got 1,000 views you could then apply to the YouTube Partner Program and monetize them. If those same videos then go on to get another 50,000 views you would profit from those 50,000 views. You can still put links in video descriptions to your own blog. You can also still do sponsored videos such as when you’ve been given a product to review. This means although you can’t profit from the video ads immediately there are still other opportunities. For example, if you have a link to your own website in the description people may click on that and in-turn you then make money from your own website. How will the change affect you? If you’re already established and have over the minimum number of views then obviously it has no impact on you. For those starting out it does mean you will lose a bit of early revenue. How much could you miss out on? I’ve done a bit of googling and getting an accurate figure on how much YouTubers earn per thousand views of their videos is difficult. Lot’s of different websites say different things. I’ve seen figures as low as $0.30 and as high as $7.60 with everything else in between. I could use my own data although my channel is tiny. So far this year (writing this at the start of April) I’ve had a grand total of 4342 views, wahoo! 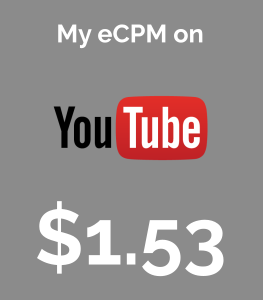 I’ve earned $6.64 meaning a CPM of $1.53. Watch out Pewdiepie I’m catching up! Let’s go with that figure anyway because despite my small number of views it seems like it’s in the ballpark. That would mean not being able to monetize the first 10,000 views costs you $15.30. If you are serious about building a big channel then in the grand scheme of things that’s not a lot of money. In the beginning, it should be all about learning the processes and getting good at uploading awesome videos anyway. If you’re like me and only do niche videos every now and again to a small audience then the money isn’t a big deal anyway. If you are in the early stages of creating a channel or have been considering it – don’t let the change to Youtube requirements for monetization put you off. The aim of the change is to look after genuine uploaders. It’s aimed at stopping money flowing to those who create new channels to upload other people’s content and then make a few bucks from it. This change will deter some people from doing that. Anything that protects those of us who are genuine users is a good thing! This could also mean there are fewer total videos on YouTube that are monetized. Perhaps that will push up the revenue received as advertisers have to compete for display slots a bit more. It may be a negative for those just starting out but overall this could be a positive move by Google. It means that youtube requires min. 10000 views on all of our videos in one channel ? Or 10000 views for each individual video ? It’s for your whole channel. It can be tricky for new channels but with good videos that contain well crafted titles and a description that contains plenty of suitable keywords it shouldn’t take too long at all. Maybe setting a target would help. For example; aim to upload 50 videos, each averaging 200 views, to reach the 10,000 threshold.